Granite, Marble, Limestone, Travertine and Onyx. Natural stone is renowned for its wide range of unique and sometimes unusual characteristics. Offering varied colours and patterns providing an individual look? The stone is sourced from all around the world. Australia, Norway, Africa, Brazil, Portugal, Spain, Turkey, Italy and India, with various wholesalers across Melbourne. Although natural stone is a hard wearing and durable option more care and maintenance is required compared to that of engineered stone. Natural stone slabs are generally 20mm and 30mm thick, the edges can be shaped to most profiles or built up to create a thicker edge. Because of the unique characteristics of natural stone it is essential that the individual slabs be selected from the stone supplier. Low porous; resistant to heat, varied unique colours and patterns; very durable; high scratch and chemical resistance. 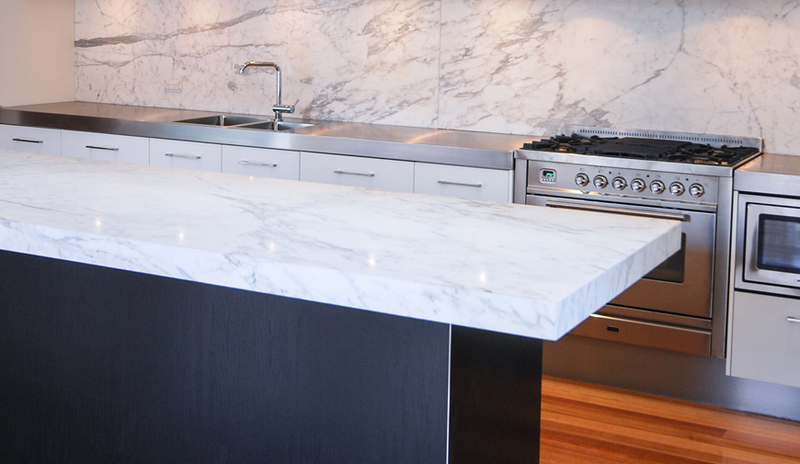 Granite can be shaped to most profiles, suits under mount and flush mount appliances. Placing hot pans directly on the surface is not recommended as this can cause damage due to thermal shock. Relatively expensive, Usually around the same price as engineered stone, slightly cheaper than solid surface, but much more expensive than laminate. prices can vary and are dependable on type and availability. Varied unique colours and patterns; Can be shaped to most profiles, suits under mount and flush mount appliances. Low scratch and stain-resistance; porous, not as durable as granite; high maintenance, requires regular resealing; is sensitive to acidic foods, vinegar, oils, red wine and some cleaners Placing hot pans directly on the surface is not recommended as this can cause damage due to thermal shock. Usually more expensive than granite or engineered stone, prices can vary and are dependable on type and availability.